Price: £6.49 (incl VAT) Sorry, this item is currently unavailable. Click here to receive notification when this product comes back into stock. 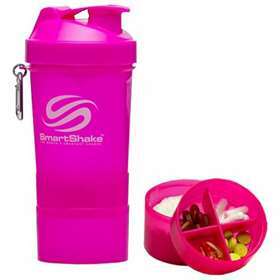 SmartShake Neon Pink 20oz Shaker has been designed with three compartments which means you can store several servings of you nutritional supplements wherever you go. SmartShake are high quality shakers that stores you daily dose of pills and powders. Has 3 compartments to hold all supplements. Product code: 77093 Price: £6.49 (incl VAT) Sorry, this item is currently unavailable. Click here to receive notification when this product comes back into stock.